FILE - Supporters of Myanmar's opposition leader Aung San Suu Kyi's National League for Democracy party wave party flags ahead of a campaign rally in Thandwe, western Rakhine state, Myanmar. Suu Kyi is banned from holding the office by a constitutional provision that says candidates with foreign-born spouses and/or offspring cannot be president. Myanmar opposition leader Aung San Suu Kyi said if her party wins elections this weekend, she will take a post "above the president," to skirt a ban on her holding the office. Suu Kyi held a news conference early Thursday in which she announced her plan but did not elaborate. She said only, "I will be above the president. It's a very simple message." During her comments to the media she also said she is concerned about whether election officials will adequately respond to allegations of irregularities in the preparation for Sunday's vote. But she added that it is important for her party to form a government of "national reconciliation" if the National League for Democracy wins. Election officials in Myanmar are still finalizing the nationwide voter list as the nation heads to the polls on Sunday. The Union Election Commission (UEC) had initially said it intended to release the final list on November 2. But the head of the Yangon Region Election Commission, Ko Ko, told VOA Burmese Tuesday the plan was delayed due to technical difficulties. Officers of Union Election Commission transfer ballots that were cast in advance in foreign countries by Myanmar citizens as representatives of various political parties watch on in Naypyitaw, Myanmar, Tuesday, Nov. 3, 2015. He said hundreds of thousands of eligible voters have been added for the nation's largest city. Myanmar’s election commission faces intense criticism as large numbers of people are reported to be missing from two previous voter lists. In his monthly speech Tuesday, the president said his government has invested full efforts to hold free and fair elections in a peaceful manner. 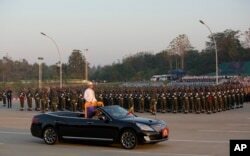 FILE - Myanmar's President Thein Sein, standing in an open vehicle, inspect officers and soldiers during a ceremony to mark the 67th anniversary of Independence Day in Naypyitaw, Jan. 4, 2015. He also called on political parties and individuals to honor and accept the election result as a show of respect to the desire of the people, urging all political leaders to coordinate and jointly explore the solution for emergence of a political event that will be accepted by all political groups in the post-election period. The general election will be the first since a nominally civilian government was installed in 2011. But with the military still firmly in control of the process, there is widespread speculation about whether the election will be free and fair.